25 years ago in 1991 Star Clippers launched its first ship "Star Flyer", a recreation of the classic sailing ships of the 19th century. The company decided that the best way to celebrate this silver anniversary would be to give the fleet and their many repeat passengers a brand new sailing ship. 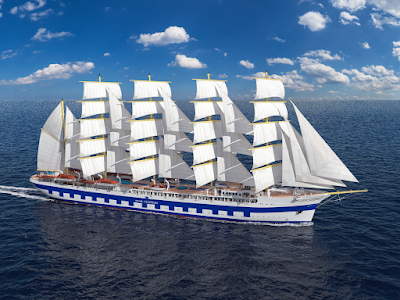 Star Clippers has announced the name of their fourth ship, to be launched at the end of 2017. The Flying Clipper will be the biggest and the most ambitious of the Clipper fleet to date, carrying 300 passengers, measuring 8770 tons GRT and powered by 35 sails totalling more than 6.350 m2. It is a near replica of the dramatic France II ordered in 1911 at La Gironde shipyard Bordeaux, which was the largest square rig sailing ship ever built. SPV Flying Clipper will be the world's largest square rigger and the largest ship of its kind afloat today. Star Flyer, Star Clipper, the current flagship Royal Clipper and the new vessel are the realisation of Mikael Krafft's lifetime dream. This Swedish yachtsman and entrepreneur has succeeded in making sailing ships commercially viable again, 100 years after their original demise, recreating the "Golden Age of Sail". The ships sail Mediterranean waters in the summer months and relocate to the Caribbean and Cuba for winter, with a new route in Asia starting in December 2016, on board Star Clipper. In Summer 2017 Star Clippers will create history again sailing in Indonesian waters for the first time with 19 departures between May 6th and October 14th 2017, and sailings of 7, 10, 11 and 14 nights, from Bali and Singapore, including Bali round trips and itineraries from Bali to Singapore and reverse. Star Clippers has consistently sought new and adventurous destinations for their guests, many of whom sail time and time again with the fleet, the repeat guest rate being more than 60% . In 2014 Star Flyer started sailing Cuban waters when the company was one of the first lines to receive permission from the Cuban government. In 2016/17 new 10 night itineraries from Havana to Cienfuegos will be introduced, while Royal Clipper will continue her popular sailings in the Caribbean during winter 2016/17. The new ship, Flying Clipper, will have three pools, one that funnels sunlight through the ship's atrium into the elegantly appointed dining room. There will be a water sports platform in the stern for use when the ship is at anchor and a variety of cabin grades, including 34 suites with balconies and four luxurious owner's suites. A restaurant in the light-filled atrium will accommodate all passengers for open-seating dining and a glass Dive bar for our younger guests will occupy several compartments of the ship . Regular guests will be delighted to discover their favourite hallmarks of all Star Clippers ships, such as the cosy library, the bowsprit net and the popular, al fresco Tropical Bar, where evening entertainment takes place. While the ship will have ecologically sound, high-tech engines, it will, like its sisters, rely on wind power and its sails wherever possible. Star Clippers operates three of the world's largest and tallest sailing vessels. Visiting ports often untouched by larger cruise ships and offering passengers the activities, amenities and atmosphere of a private yacht, Star Clippers is recognised as one of the premier speciality cruise lines. Cabins: 150 cabins including 34 suites with balconies plus four owner's cabins.